Not a huge amount to report this week, I've had my parents up for the week plus I was away for a couple of days on a work trip. As a result I've not made much progress on Codename: Vacuum. It's not stood still though. I had a playtest game at lunch time one day last week and I've got the first session report from my playtesters in Bedford. As I mentioned last week, they had some issues with the first draft rulebook, but they managed to overcome my inept rulebook writing and played it last week. They've found a bunch more small errors in the cards and rulebook which I'll correct this week. Their game was a long one. There were four players, all new to the game and they were learning it from the (crap) rulebook and it ended up lasting over two and a half hours. It's always the case that a learning game with rules explanation and rule looking up will take longer, but that's still significantly north of what I was hoping for. Having a more structured rulebook that more clearly explains things will help, but the game will need simplifying too. I was hoping for more of a Race for the Galaxy play time than Twilight Imperium. Since Codename: Vacuum doesn't have simultaneous play it'll never be quite as fast as Race, but it can play fairly quickly, and with my experienced players at work we can usually get a game done in under 20 minutes per player. We even got a five player game with one new player done in 1 hour 40 minutes a couple of weeks ago. Still, the feedback is reminding me that my design ethos definitely is make a complicated game and then simplify it, rather than starting with a simple game and expanding it. Vacuum isn't intended to be a streamlined euro like Sumeria, but there's definitely a lot of scope to simplify things. I'm trying to focus now on re-writing the rules to clarify things, and at the same time, work on those rules that are complicated to write or explain or ones that people often get wrong to try and streamline the game. The simpler it is, the easier it'll be to teach or pick up for the first time. Of course, while doing this, I've got to be careful not to rip out the heart of the game! In other news, I was contacted a few weeks ago by a previous Reiver Games customer who was interested in playtesting Codename: Vacuum at a convention in Australia. I've been working to get a print-and-play copy ready for him, but in the light of the feedback about the rules quality, I've had to turn him down. I feel bad about letting him down, but I'd rather give him a hand-made copy later (even with the shipping cost to Australia) than provide a poor quality version now. The week before last I sent two copies of Codename: Vacuum to my friends Paul in York and Terry in Bedford. In both cases the games arrived in time for their Thursday Games Night, and that Thursday Vacuum got played at my Games Night - I was excited that it could be getting simultaneously by three groups at the same time! Paul, who had played it once before about nine months ago, emailed me to let me know he'd received it and it all seemed fairly self explanatory, he just had one query - the rules contradicted themselves - which bit was right? It was an artefact of me creating a new 'simpler' version of the rules at the last minute, I let him know which bit was right and fixed the other bit straight away so the next printing wouldn't have the problem. A week passed, still no word from Terry. Then last Friday I got an email from Andrew (who plays games with Terry, was also one of my key Reiver Games playtesters in my Bedford days and who accompanied me to my second Essen show in Germany). It turns out that my attempt at writing the rules had been an epic fail. Terry, Andrew and Stewart (all three very experienced gamers who regularly learn new games from their rulebooks) had set up Codename: Vacuum to play the previous week, read through the rules and then put it away! After reading through the rules, three very experienced gamers were so confused that they just packed up and played something else instead. That is a legendary rulebook failure. In the end, Andrew took the prototype home and has tried to work through it solo to get his head around it enough to explain it to the others. Clearly, the rulebook needs a lot of work. The fact that Paul had played the game once before gave him enough of a frame of reference for the rulebook to work for him, but for both playtesting and game sales, the rulebook needs to be clear enough that you can learn the game from the rulebook. 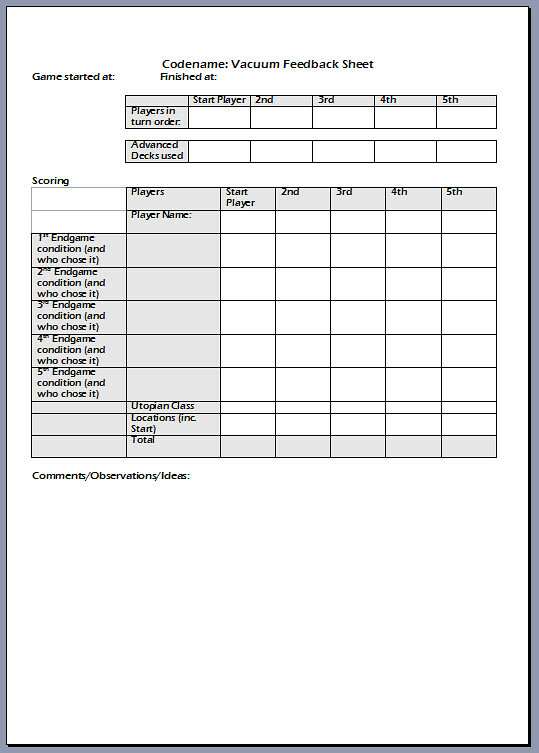 This was the first attempt at a proper rulebook for Codename: Vacuum, and the first attempt at a blind playtesting, where you learn the game from the rulebook. The rulebook as it stands fails to pass muster. I need to restructure it to give a better sense of how the game is played, what you are trying to achieve and how to achieve it. The rulebook was a fairly last minute thing done when trying to get the prototypes out the door. It needs more effort than that! After each game of Codename: Vacuum I record a bunch of information, about who played, how long it took, who scored what in which category, etc. I've not made much use of the information yet - the game changes too frequently, so I don't have enough information about any one version to draw any useful conclusions. Last week though, I sent out a couple of playtest copies to some previous gaming buddies who used to be my core Reiver Games playtesters. 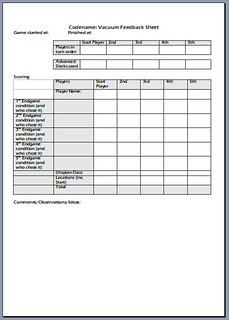 In the package with their copy of the game were a handful of feedback sheets, so they could record the bits of the game I am most interested in. So what am I looking for? I'm trying to find the particular biases and unbalanced areas that the game is bound to be full of. The game has 15 decks of cards, 8 possible starting territories and five (or fifteen!) endgame scoring conditions. I've played it nearly forty times and that is nowhere near enough times to sort out all the balance issues between that number of variables, especially as I bring out a new version every month or so and so I effectively have to start again from scratch at that point. Now that there are multiple copies of the game in circulation, I can get more feedback about each version and hopefully start doing something useful with it. Data analysis! Science! P.S. Award yourself 10 points if you recognised the Firefly quote in the title! I'll get to the subject of that provocative title in a minute! Aside: this is my 666th blog post. Make of that what you will. Just a brief update on progress this week, and a review of my card purchases. Setting the goals has really focussed me, I've worked quite hard the last few weeks to the get playtest copies ready, spending my evenings after The Daughter goes to sleep printing, cutting and collating to get the copies assembled. The biggest stumbling block was the rulebook, which I had to write from scratch in Adobe InDesign since the previous one was written in Microsoft Word, had no examples and was hideously out of date. The last minute change to simplify things that I thought of last week didn't help as that made changes necessary close to the wire. As another aside, I recently read an article on BGG by Lewis Pulsipher, designer of Britannia among others, stating that to be taken seriously as a designer you need to be working on multiple games at once. One game makes you look like a dilettante apparently. I consider myself focussed, rather than a dilettante, but maybe others feel differently. Anyway, I've a family now and they come first, with limited time available the only way I can make any progress is to focus on a single game. In other news, in making these prototypes I mentioned above, I've finally got around to using some of that card I bought a couple of weeks ago. I bought it from PaperCutz a supplier I'd not used before, so I thought I'd review the purchase briefly. I've used the card extensively in the prototypes: the box insert, deck dividers, cards and player mats are all printed on and made from the new card. PaperCutz were pretty easy to deal with, I ordered over the internet, the card arrived in a couple of days. The card was fairly well wrapped and then boxed, but regardless both the 300gsm and the 240gsm were slightly dinged on one corner, probably as a result of exuberance on the part of the courier. It's not a problem, since I cut at least 10mm from each edge as part of the construction and I can feed the dinged corner into the printer last so it doesn't throw the printer out of whack, but still slightly disappointing. I bought 25 sheets of the 300gsm for making box inserts and 250 sheets of the 240gsm for the cards, dividers and player mats. That's enough to make 15 games :-). Or at least it was until I fell in love with the 300gsm stuff. Honestly I'm not normally a deviant, but the silky smooth, unblemished exterior coupled with a firm core that kinks pleasingly when you caress its surface with a craft knife totally got me. I've used it for the box inserts as intended, but also for the dividers and player mats, so now I've enough card to make 3 more games. I need more. 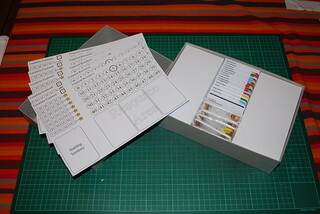 I'm going to get another 100 sheets of the A3 300gsm, which I'll use for the dividers and player mats and I'll also get 25 sheets of a more voluptuous SRA3 (a slightly bigger size) for the box inserts. It turns out that I can't do maths to save my life, and the calculation I'd done in my head which lead to the decision that A3 would be big enough for the box inserts was way out. SRA3 isn't big enough! But it's close enough and will do. After those purchases I'll have enough to make another 15 copies - so I should be sorted for the next wave of prototypes in the summer too :-).